Many times it is required in PLC Programming that we want a particular bit or Output to be on for just one Scan Cycle of the PLC. This is required when we need just one pulse of output when the input condition goes true. In Omron PLC there are two Instructions available for this purpose. The Instruction for Differentiate UP id DIFU, it turns the designated bit on for the one scan cycle of PLC when the execution condition goes from OFF to ON. Syntax:- DIFU A, where A is the Bit Address. This type of instruction is needed when we have to make a logic for moving some value in Data Word and at a single time for this condition. So this instruction makes the task Much easier. DIFD is used when we want a particular output bit to be ON when the execution condition goes from ON to OFF. DIFD can be used to execute an instruction for just one cycle when the execution condi­tion goes from ON to OFF. The operation of DIFD (014) depends on the execution condition for the instruction itself as well as the execution condition for the program section when it is programmed in an interlocked pro­gram section, a jumped program section, or a subroutine. DIFD(014) has immediate refreshing variation (!DIFD(014)). When a CPU Unit built-in output bit has been specified for R in this instruction, any changes to R will be refreshed when the instruc­tion is executed and reflected immediately in the output bit. The operation of DIFD(014) will not be consistent if the same function block instance is executed more than once in the same cycle. A subroutine will not be executed while the input condition for the subroutine is OFF. Caution is thus required when using DIFD(014) in a function block definition. For details, refer to information on SBS(091). 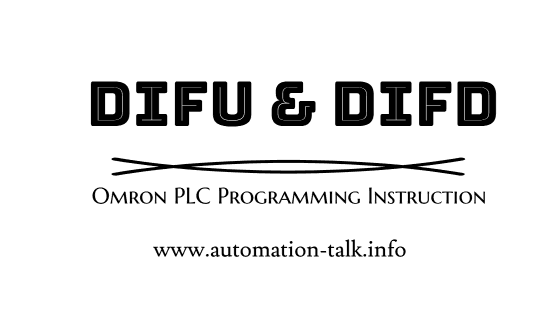 We have made a simple PLC Program consisting of the DIFU and DIFD Instructions. You can get the PLC program from below link. PLC Program Omron DIFU and DIFD. Also you can subscribe to get all latest updates through Email. Very Nice & Helpful Omron Instruction.